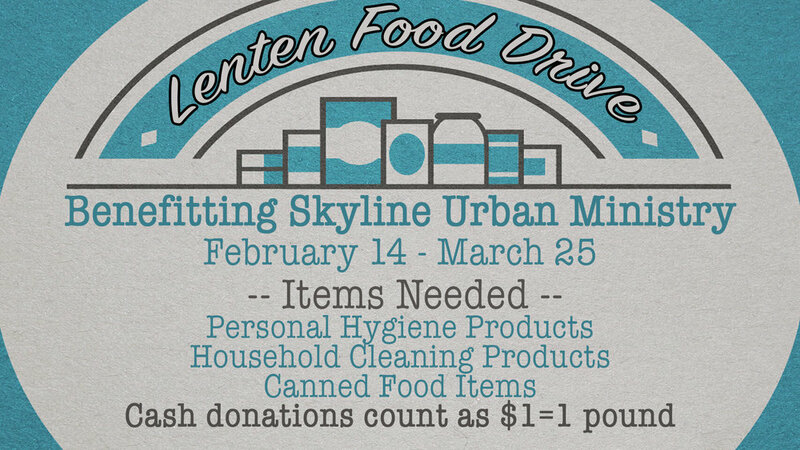 Once again, we will challenge New Covenant United Methodist Church in a Skyline Food and Goods Drive. The church with the most donated food, household items and toiletries will win bragging rights for the year! Skyline Urban Ministry is a nonprofit ministry dedicated to impacting lives, empowering those in need and addressing the roots of poverty in Oklahoma. The ministry offers a variety of services including a clothing closet, eye clinic, and senior services. They serve more than 300 families each week in their food pantry and depend on donations of food and household items such as toilet paper, shampoo and soap. The challenge begins on Wednesday, February 14 and runs through March 25. Will you help us provide for the needs of so many Oklahoma families by bring a food, toiletry item or household item such as detergent or paper towels? Let’s show our Edmond First United Methodist spirit and win this challenge for a third year in a row!